Arriving for week two of the Francine workshop, feeling guilty for not having finished the homework, tired from a late night of sewing and early start, and frazzled from an intensive day at work, wasn’t the most auspicious start to our second session. However, the mental re-set that I get from sewing quickly worked its magic, and as I got busy catching up with the more organised members of the group, I felt myself really relax. Week two was mainly focused on attaching the collar pieces front jacket facing, using techniques that were certainly new to me to ensure that everything sits ‘right’. Just thinking about the way that the collar and jacket facing needed to be rolled differently and tacked in place was fascinating – there are so many stages to garments that we wear everyday, without thinking about their construction. Which is even more amazing when you’re a person who tends to think about garment construction in most of her idle moments. Julie took the time to demonstrate the new techniques, again really explaining clearly why different stages were necessary and how the elements built up towards the finished jacket. I know from reading the words in the written pattern that I’d have really struggled to understand the different stages of the instructions without a handhold, so I’m delighted that I had the opportunity to learn in person. I began to realise through this second class that I was going to have to make a second Francine soon. Despite my #makenine plans for 2019, it was becoming clear that to really embed the learning from these workshops, I will have to work through all the steps again by myself – without an oracle to consult this time. And the sooner I do it, the more likely I’ll actually remember the things she has told us. Another element of this week’s class focused on pressing, and using steam to manipulate and set the wool fabrics we were working with. I used a tailor’s ham and clappers for the first time (more kit, dear family members, that will always be appreciated re future birthday/Christmas/’just because’ gifts) and gained a much better understanding of the way that this kind of fabric responds to the heat and steam. Once again the evening flew by, with lovely chat with the other sewists, GBSB gossip, carrot cake and tea, and all too soon Julie was gathering us to explain our homework – mainly the lining that would need to be prepped for next time. This time around, I had much more time to do my homework – and realising that I’m much happier sewing when there isn’t a clock counting down next to my head, I took my time over the weekend to cut and stitch the lining.After working with the lovely wool coating, it was a bit of a transition to be using slippery lining fabric (with a broken and ridiculously blunt rotary cutter to boor), but it all worked reasonably well. We also had to set in the sleeves, tacking them in position so that Julie could check them before we stitched them in properly. Arriving on Wednesday for our final class, it was clear that there was still a lot to do. After our sleeves were approved and carefully stitched in place, the majority of the class was spent learning and applying skills in putting in sleeve head wadding and shoulder pads. It was amazing to directly see the difference that shoulder pads made – the lovely ones that Sew Over It had sourced for us were a far cry from the 1980s beasts that spring to mind when I think about shoulder pads, and the gentle way that they raised the jacket and improved the way it hung on me was immediately obvious. Time consuming for sure, but definitely worth while. Putting in the lining was next, and again it transformed the jacket – you could really ‘see’ the garment it would (hopefully) become. Again, the construction was fascinating – the additional fabric in the lining to ensure it can move easily when you’re taking it on and off, and the way it all comes together when you finally join it to the main fabric. Each class in the workshop series is three hours long, from 6:30 to 9:30pm – which after a full day at work is pretty tiring. Our last class didn’t finish until 10pm (thank you so much for giving up your time for us) because Julie wanted to make sure that we were all clear on the instructions for the final elements of construction. 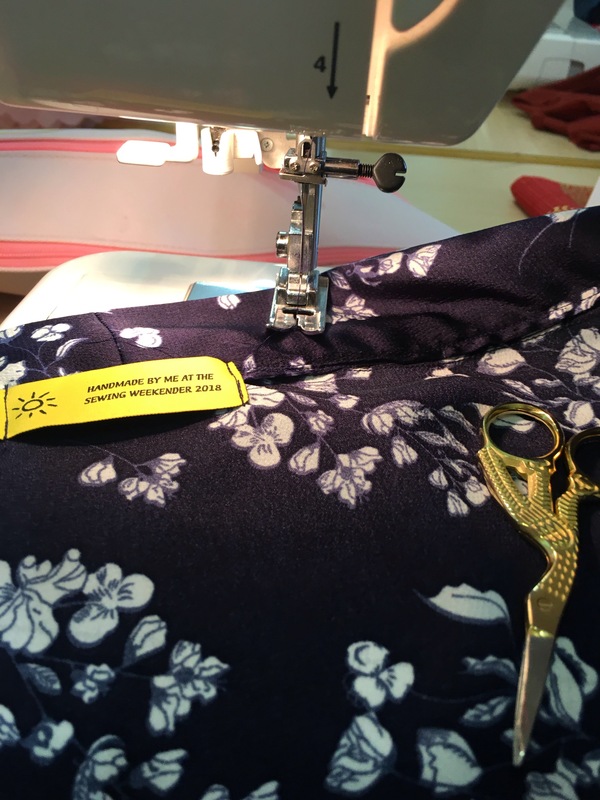 There are lots of hand sewing elements that are small but important – joining the lining at key points to the main fabric, and finishing the hems cleanly and accurately. There simply wasn’t time for us to finish everything in the class. Though it seemed like there was a huge amount to do when I got home, each stage was quickly finished. Well, I say each stage – it’s now nearly a month since the class finished, and my jacket is still sans button holes and buttons. One of the suggestions in class was to take our jackets to a specialist shop in Berwick Street for the button holes – on the basis that it would be truly heartbreaking to get this far with a jacket and then to make a mess of the button holes which would be so very obvious. I decided this was excellent advice, but being me – I’ve just not found the time to actually make it there yet. You can tell I’ve given up to a certain extent now, as this blog post has been waiting for all the intervening time for me to get this done, and it’s clear it won’t be soon, so here you are. In fairness I’ve been wearing the jacket anyway – realising that I almost never do up buttons on a jacket like this. One adjustment that became necessary quickly was where I’d managed to sew the lining badly in one sleeve, which was pulling the arm shape so it couldn’t hang straight.That one was quickly unpicked, and sadly now doesn’t look as beautiful on the inside as it had done, but no matter. Otherwise I’m so very pleased with it. Reflecting on the workshop series now – it is an experience I would definitely recommend. The sense of achievement in doing something so completely out of my comfort zone is immense, and I’ve become fascinated with tailoring methods – very keen to learn more (maybe a waistcoat for my husband next, inspired by the GBSB). As you’ll have gleaned, the teaching was supportive, clear and pragmatic – Julie knows her stuff, and she knows how to communicate it. She’s incredibly patient and though I’m sure we tested that to the limit, you really felt how much she wanted us all to achieve. The small group of sewists in the class (there were six of us, which is the maximum class size) were also brilliant company, and I’m looking forward to seeing their jackets on social media. I already miss our Wednesday evenings (though it is nice not to be quite so tired on Thursdays). The only suggestion I’d make about the classes would be for more! Four weeks, rather than three, would be perfect. There was so much we didn’t get the chance to do with supervision. We spent a lot of week one cutting out our patterns and fabrics, and it was brilliant to have toiles available so that you could ensure you were cutting out the right size, and adjusting it in the way that would fit your body – before you cut any fabric. Assuming that’s not financially viable to do four weeks, perhaps class participants could be asked to come in at another time before the class started to try on the toiles in store and then at least come with the pattern pieces cut out – and if the sizing looked good, to cut the fabric pieces too. It was all valuable, but if I could choose between having Julie on hand for cutting out fabric or doing the final elements of construction, I’d prefer the latter. Other than wanting more of it, I’ve no negatives at all to share about the class. I heartily recommend it, and will certainly be back for more classes at Sew Over It in the future. Thank you! My lovely husband came up trumps with my Christmas present this year, with a three-evening workshop at #Sewoverit to complete the #Francine tailored jacket. I’d done one of their courses in the past – the #ultimatetrousers pattern, which was the first group sewing course I did, and aside from a workshop at the Sewing Bee live exhibition last year, still the only one. There’s so much you can learn by yourself when sewing – and I must admit that one of the things I like best about this hobby is working by myself to be creative – problem solving when things go wrong and finding my own way through things (obviously with the expertise of the sewing community via the internet to support me). Undeniably however, there are plenty of times when having an expert to guide you makes a real difference. I’d certainly found that with trousers – having someone to help you fit trousers on yourself is a wonderful help. One of the excellent things about the #sewoverit classes is that they have toiles of their patterns made up in all of the size range – so you can try on the size that best matches your measurements, and then see how you might need to adjust your pattern pieces to fit the quirks of your body shape. Being 5’2”, RTW trousers have NEVER fitted right, so the expertise of the workshop leader (Julie Johnston – more on her in a moment) in helping to identify the ways to make the pattern fit me correctly was a huge help. The first week of the #Francine workshop similarly involved us trying on the toiles of the jacket and seeing where we might want to adjust things. Being short of leg but kind of average on top (a bit on the short side, but not excessively, not a lot of bust but still in range), I matched the size 12 reasonably well. Julie noted that I might need a slight sway back adjustment, but that would be best done at the end as she wasn’t convinced it would be necessary. The rest of week one was spent cutting out our pattern pieces and main fabric. We had all had to source and bring the main fabric and lining, and this was a decision I’d agonised over from Christmas through to the end of February. I have a few pairs of navy/dark blue trousers with no jacket that particularly went with them – so I wanted a fabric that would contrast well with navy, but not necessarily ‘match’. I’d ordered samples from Abakhan, Truro Fabrics, Croft Mill, Minerva Crafts and Dragonfly fabrics and they were all lovely. Even with the sample pieces in my hands however, I found it hard to assess the drape and weight and to really understand how the fabric would work for this pattern – mainly I think because I’ve never attempted anything like a tailored jacket in the past. In the end, I took a walk up to the main branch of Fabrics Galore in Battersea one lunch break, and found myself the fabric of my dreams. It is dark grey wool coating fabric, in a herringbone design with flecks of blue. I have tried and failed to photograph this accurately, so you’ll just have to trust me on it. [What is it about photographing fabric that is so frustrating – is it just the quality of a mobile phone camera, or settings that try to adjust the colours? It’s much darker than the image here.] I thought I’d buy 2.5 metres so that I could also make a skirt in the same fabric, but found when I got to the till that it was the end of the roll – and that in fact, while they had exactly the right amount in theory, the end had been cut on a slant – so my 1.6m on one side was actually 1.5m on the other. I crossed my fingers and bought the fabric, along with a beautiful green lining fabric. Inevitably, that 10cm difference on one side made working out a lay plan for the pattern an intricate game of tetris, but with Julie’s help I finally managed it. The challenging bit was in laying out the collar piece so that the herringbone would be aligned on both sides – something that’s not a problem if you don’t have a fabric with a pattern, but involves a bit of head-scratching if you do. It’s fair to say that it ended up a very efficient use of the fabric, and my scraps in the herringbone were minimal. The three-hour class went by in a flash. 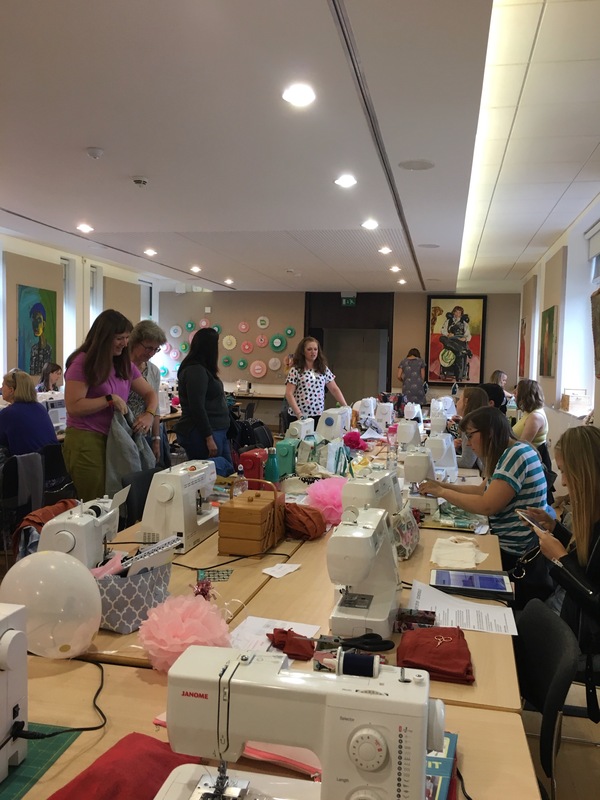 While we worked on cutting out our pieces, it was lovely to talk to the other sewists present – it’s not often that you get to commune with fellow sewing people in the flesh, and everyone was interesting and shared the same passion for garment making. We also got to eat cake, drink tea and stroke the wonderful array of fabrics and haberdashery in the Sew Over It store. What’s not to love? I don’t know if Julie runs all the Sew Over It courses, but her calm and practical approach is very reassuring. She knows the patterns inside out, and her explanations don’t just tell you what to do but also help to contextualise the instructions – so you’re not just learning what to do, but also why. It makes such a difference when you’re branching outside your comfort zone, like this class. She’s exceedingly patient, and you get the feeling that she’s rarely unable to answer a question from her class participants. I’d highly recommend her classes, and I’m sure that Lisa and the team at Sew Over It value her highly. Before we found ourselves back out in Islington to make our way home, we had clear instructions from Julie about our homework. This involved finishing cutting out all the pieces (the first time I’ve had a pattern with 20 separate paper pattern pieces resulting in (I think) 51 different pieces to be cut out in the three fabrics), including the interfacing pieces. We had to apply the 23 pieces of interfacing to the main fabric, and join up the main straight seams of the jacket. The advice was that this was about 4 hours of work. Ha! Maybe for efficient sewists, but not for me. 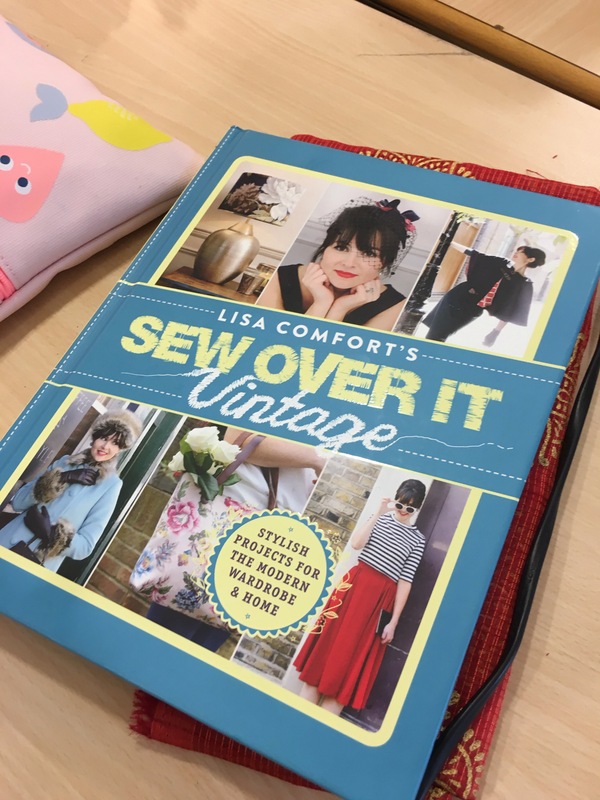 It was unfortunate that I had a long booked holiday with my book club to Berlin at the weekend (for the record, I belong to the best book club in the world, which involves an annual city break with a loose book tie-in to justify the trip), so my available sewing time was limited. The class was on Wednesday, I didn’t get started on Thursday and was away Friday to Sunday. Monday night we had commitments so it was Tuesday night when I finished work that I was finally able to make a start. “It’ll be fine” I told myself – I could start around 6:30 and figured I would be finished around 10:30. We had been advised to purchase some woven tailoring interfacing at Sew Over It, rather than the slightly crunchy cheaper products I’ve bought in the past. Damn it but now I’m spoiled for life! I found the tailoring interfacing so much more accurate to cut, and I love the way that it joined with the fabric to make it thicker without changing its drape and movement. It combined well with my fabric, and the iron-application was satisfying and quite therapeutic. Once more that evening I was reminded that I am not a speedy sewist. As I’ve said before, I don’t consider that a bad thing – I enjoy taking my time with the process, and particularly with a jacket like this, I wanted to make sure I worked carefully and accurately. Obviously I also had to eat dinner, at least listen to the Sewing Bee and interact with my family, so it was 11:30pm by the time I made it to bed. My homework was not quite complete, but it was close and I was VERY excited to be going back for week 2. Comfort is everything. 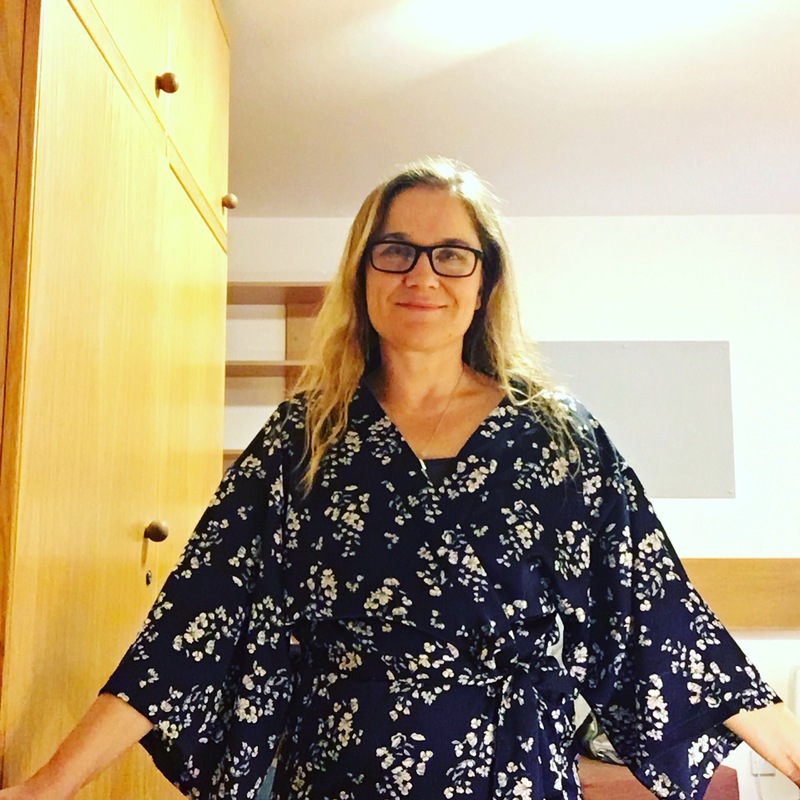 I sew things I want to wear, and for me that means clothes that fit without constriction, that flatter a body that is likely to eat a hearty lunch, and that move easily between an office job and a home with assorted children, cats and commitments. That might explain why I chose to spend new year’s day sewing my fourth Sew Over It Heather dress. Fourth. Yes, I can’t believe it either. This was an impulse sew, and all the better for it. I’d not found the time (really, let’s face it, the motivation) over the Christmas break to get started with a project, but enjoying a quiet soothing day before returning to work on 2nd January, it was a perfect quick sew. I’ve not been sewing long enough to have many patterns that I’ve made repeatedly – unless we count the TATB Margot pyjama trousers from her first book and actually her Coco top which is a perfect fit for me. Otherwise, though I tend to think I’ll get great value from a pattern by making 12 of them, I usually then get distracted by the next shiny thing. There are so many lovely patterns! This impulse sew derived from me searching through my disorganised and overflowing stash for a couple of metres of navy ponte that I knew was in there. I was mulling a cardigan or a dress with it and wanted to see how much I had and what it would tell me it wanted to be (or something like that). I didn’t find the navy, but I found a 2 metre piece of a black and white lace patterned ponte that I’d entirely forgotten I even owned. My disorganisation is a high price to pay for these moments of serendipity, but as I’m stuck with the former, it’s only right that the latter should bring me such joy. From initial cutting out to snipping threads from the finished dress was about half a day I guess. A longish half-day because I’m not speedy. I’d adjusted the pattern slightly over the last three makes, mainly adding about 4cm in length (I’m 5’2, so this is an adjustment I almost never have to do – guess my mid-forties self enjoys a slightly longer dress length than the SOI standard). I didn’t have quite enough fabric to cut the neckband on the grain, so used the cross grain – and it’s really the only part of the make that annoys me. It doesn’t quite sit right, and if I had more patience I’d unpick it and do it over. Maybe I will. Or maybe not. Let’s see if it annoys me still after its first outing – and whether anyone else on the planet would even notice. Except sewists. They would notice of course, but they’d be far too charming to mention it, and insist that it was lying completely flat. The Heather pattern is a gentle cocoon shape with deep diagonal pockets on the front. Somehow I find it flattering, though logic tells me it shouldn’t be. Something about the intentional apple shape both gives the illusion of the waist bulk being a dress feature (rather than a post-Christmas feature) while at the same time allowing easy movement, capacity for lunch and pockets full of my daily essentials (phone, tissues, glasses etc). If it’s not as flattering as I think it is, please don’t burst that bubble. Sometimes I think that nature designs the failure of our eyesight at just the right rate, and I just hope that my husband is as poorly sighted as I am now. The verdict for me is a happy one. There’s nothing as soothing in having to return to work on 2nd January as having a new, comfy frock to wear. I spent the last day of my holidays, in my PJs, doing the hobby I love. An excellent start to 2019 – plenty more days like this one please.